Finally… txt-book app lets you convert text message conversations into an attractive and personalized storybook. 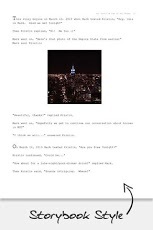 Two unique PDF export styles: CONVERSATION or STORYBOOK. You can add a title, cover photo, nicknames, and back-cover note.Save it. Send it. File it. Print it. Keep for your records. Keep as a diary…or make it the perfect gift! A txt-book is a perfect and easy gift for anniversaries, birthdays, graduations, Valentine’s Day, long-distance relationships or just…because. Text message conversations chronicle our modern lives. With txt-book now you can preserve the jokes, fights and photos that we share every day. 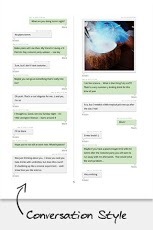 CONVERSATION: Displays the texts and photos in bubbles similar to the way it appears on your phone. The date and time, if chosen, are displayed above each bubble as well as the speaker’s name. Photos appear larger than they do in your text-message conversation. STORYBOOK: Adds phrases to the beginning and end of text messages so that your text conversations look and read like a novel. Text messages are always shown in quotes, and words like, “replied Kristin” are added after a text message. Sentences are used to introduce a new day such as, “On July 4, 2013 Mark texted Kristin,” so your txt-book flows like a story. Photos appear larger than they do in your text-message conversation. You don’t have to choose between one – if you get the UNLIMITED package, you can make as many books as you want. Your Cover Page features a photo that you select and a title that you create. The Back-Cover Note allows you to write a description that explains the book’s meaning, or create a special message to the recipient such as, “To Kristin – I hope this book has a second volume. Please keep this to remind you of our first three months. Love, Mark.” If you don’t want a Title, Cover Photo or back-cover note then you can simply leave them out. Txt-book was created so people can transform the conversations between friends, family and lovers into a book. Many people simply use txt-book to keep a personal record of easy-to-read volumes of their day-to-day conversations. You can be the author of hundreds of txt-books…get started now. The app requires use of the phones memory to create the txt-book; if you receive an “out-of-memory” error then force-quit other applications to free up space for txt-book. 1 year of texts can be a hundred pages long. if you have many texts then create several shorter books as Volume 1, 2, 3…and so on so your books are easy to read, share and print. You may experience book-creation problems if you select a date range that is too long. It means your book is too long to create and you need to make book volumes.